In my third heat I thought I played well again. I feel like I've been unlucky in all three of my heats thus far, and that's put me in a bit of a pressure situation going into tomorrow's final heat. It's an 8 handed table, and I MUST finish 3rd or higher to advance to the next round. It's that simple. 4th I'm out, 3rd I'm in. I knew coming into my last two heats that I'd need at least a 3rd and a 4th, so I got the 4th, time to knock off a top three finish. I've been thinking a lot about poker recently. Watching it, learning, etc. Soooo much has changed it's difficult to even know where to start. When I started playing tournament poker, one of the absolute best in the game was T.J. Cloutier. I always did well against T.J. because I felt like I had a good understanding of what he was trying to do at the table. T.J. would play pretty solid, not get too crazy aggressive at all, and then sporadically he'd make a "play" by coming over the top before the flop with nothing. He'd use his tight image to build up what Phil Laak calls "Dormancy Vig," meaning, that he'd get away with his random bluffs because his opponents would give him tons of credit. So T.J., and to a lesser degree John Juanda, essentially looked for spots where they could push someone around. Often their reads were solely tell based. T.J. might wait for the young kid in the 5 seat to raise it with his left hand very quickly, and T.J. would know that meant the kid didn't have it. When he had it, the kid would hum and haw, take his time, and then put in a soft raise with both hands. When you spot stuff like that, and are good at it, this tournament strategy becomes very effective and that methodology was one of the key reasons T.J. put up such consistent results. He wasn't playing the cards, he was always playing the man. It was really just that simple in the old days. Most of the tournaments didn't require you to play much deep stacked poker, so picking up pots before the flop became "enough" to be successful. You didn't really need to understand how to break down a hand. You didn't have to be all that good at post flop play. You could use this strategy, fire a strong continuation bet, and then kind of just give up from there. 1) The average player is so much better and if they sense that you are coming over the top weak, they may 4-bet you even weaker. That stuff NEVER used to happen unless it was QQ KK AA or AK. You could 3-bet people all day, knowing that they'll never 4-bet you unless they have one of those hands. Also, if this is your only weapon, you won't get to use it enough to stay afloat in today's game. Sure you'll get away with it a lot, but you won't win much when you do. If you push too hard, then it becomes less effective because you'll lose credibility with your 3-bets. 2) The tournament structures are better. This is a VERY important reason. T.J. used to have a funny track record in the WSOP main event. He would bust out on day one about half the time, but when he made it through day one, he virtually ALWAYS made a deep run. That's because his strengths lied in tournament knowledge and playing shallower stacks. 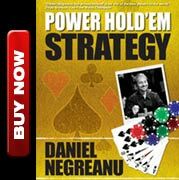 His strategy simply worked much better when the antes and blinds were significant enough for him to ship it on people and increase his stack size enough to warrant it. It's a foolish strategy when the blinds are 25-50 and you have 10,000 in chips, but when you have 40,000 in chips at 1000-2000 blinds then it's an excellent weapon. The key reason "old school" isn't effective anymore, is simply because players today are SO much better after the flop. It's like night and day today from even how it was 5 years ago. A completely different form of poker. Playing tight, and then waiting to make a play by coming over the top of someone just isn't good enough anymore. You need to learn more about bet sizing, getting maximum value for your hands post flop, polarizing your range by bluffing more in certain spots... It's a lot of fun, but you have to fight for every chip, whereas it used to be that you could sit there and wait for donations. I watched a lot of poker on TV recently and I saw one player in particular looking like a fish out of water. Whether it was a cash game or a tournament, he habitually won the minimum on his big hands, got outplayed when he missed, and paid off when he was crushed. He made no successful high level bluffs because those plays are just not in his nature. Oh, and if you were thinking I was talking about myself, lol, you are wrong, although I could see how you might get that impression! In studying this player, the differences between what worked in the old days compared to the game today, became a bit of an epiphany for me. It's so obvious to me why that approach cannot defend against the players of today. It's just too simplistic. I never would use that strategy myself anyway, but it was still something that dawned on me as to why players who used to have success don't do quite as well anymore. If you really want to learn how to improve your game, you can watch guys like Phil Ivey, Tom "Durr" Dwan, and Patrik Antonius. On the last season of HSP I feel like my game improved a ton simply from playing with them. I admire all three of their skill sets, and they all have very unique, and distinct styles that are all effective. Durr is the loosest of the three, but he also tends to get slightly more action which is a decent trade off I guess. What you learn from them CAN teach you how to be a better tournament player too, even though they are playing cash poker. Early stages of tournaments today have plenty of play and often play similar to a cash game. In the past, you could be a great tournament player without really having to understand cash games or deep stacked poker much at all. That's not the case anymore. You should practice both tournaments and cash games even if all you want to do is be a tournament player. I was goofing around with Phil Hellmuth today at the Premier League and he told me to read his blog, so I did. I was a bit surprised by what I read, but not entirely. Hellmuth believes that he had a bad year last year because his preparation wasn't there and if he did his "PEMM" this year it would be enough to bounce back and have a big year. What's missing from his blog, and I've told him this, is a little LTPB "Learn to Play Better." You take that ego.. you swallow it, and you come to the realization that instead of fighting the truth, you should instead learn from the younger generation who have spent countless hours breaking down the game. They know stuff that no one knew years ago. Why NOT learn from them? I've examined my own game again and again over the years. I think you have to do that or you get stuck in a rut. I've seen it happen to players for over 10 years now. They learn how to think about the game one way, and they never really allow themselves to think outside the box and realize that the game dynamics have changed so much, that they simply have to learn to adjust... or lose. When he told me to read his blog I was hoping and expecting to read something a little bit different. Not that he isn't winning because he's not meditating or running laps, but that his skill set needs an upgrade. Something holds him back from admitting that for some reason and until he does, he'll struggle. Until he starts to come to terms with the fact that publicly stating that he is the "Best NL hold'em player in the world BY FAR" makes him look foolish, then he is doomed to be ridiculed by his peers. I really do like Phil Hellmuth. I like him a lot actually. When I was like 17 years old, I was a Hellmuth "fan" after watching old WSOP tapes of him winning the main event. I don't want to see him lose. I don't want to see him play badly. I'd like to see him win his 12th bracelet. It's good for poker, whether you like him or not, it's good for poker. Based on what I see from him lately, though, #12 may never come unless he learns to respect the fact that the younger kids have a broader knowledge base and that he needs to learn how to apply their "tricks" to his own game. I have a core group of young online guys I talk about hands with all the time. They think about things very differently than I do at times, and it can be really helpful to understand their perspective. It's less about who's right or wrong, and more about healthy discussion about the game. I think I often surprise them with my thoughts on hands, and I know I always learn a thing or two myself from listening to them. Guys like Justin Bonomo or Isaac Haxton come from a completely different world than I do poker wise, and we don't play the same way, but I have a great deal of respect for their knowledge base. They are smart guys. Jason Somerville is a bit of a boy genius as well and is constantly thinking about poker. I'll occasionally bounce hands off him and Vivek Rajkumar, or even add my two cents to hands they bring to me (I morphed Somerville into a small balling min raiser!). Then there's Adam Junglen. Adam is another one of the young guys who thinks about the game differently than I do at times. I've talked to Shaun Deeb over dinner also, but man, oh man are we on a completely different planet when it comes to poker! We think nothing alike when it comes to tournament poker. He is an online phenom, but I think he needs to reexamine his approach to deep stacked tournaments. Lastly, I have interesting conversations sometimes with PokerStars Team Pro Lex Veldius. We needle each other about the way we play, but I think there is a mutual respect there. He thinks small ball is complete crap, and I think he's a bit of a reckless 9-betting nutcase at times, but there is definitely respect there. I learned a lot from him at EPT Barcelona earlier this year when we were at the same table on day 1. We both had great days. Mine was very slow, and very steady... his was, well, maniacal to say the least, but he ended up in good shape. 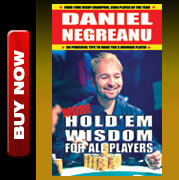 Poker is a beautiful game, and while it sounds like a cliche, you truly never stop learning. Once you stop learning, well, you better have some other form of income because you can't hack it in this business if you don't keep trying to improve your poker game. If guys like Phil Ivey and Doyle Brunson tell you that they learn something new every time they play poker, what do you think makes you so different?